Most of us love our morning cup of joe. 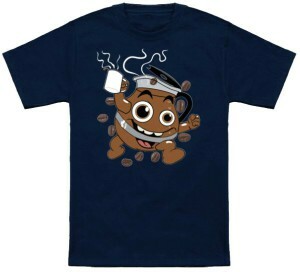 This t-shirt maybe what we look like after a couple cups of strong coffee in the morning. Let’s get the day going! This graphic is a classic, ready to make people laugh. It is a large coffee craft that kind of looks like the Kool-Aid mascot. This one however, is full of delicious brown coffee. His eyes are a little crazy probably from all the caffeine he has. He is running with a full mug of coffee and there are coffee beans everywhere! Get this t-shirt in sizes running from Small to 6XL. Perfect for all the java lovers in your world. It comes in many different colors to choose from like ice blue, cream and dark chocolate. It is made from 100% pre-shrunk cotton, so the size you order is the size it will always be. It will also be so comfortable for any occasion.